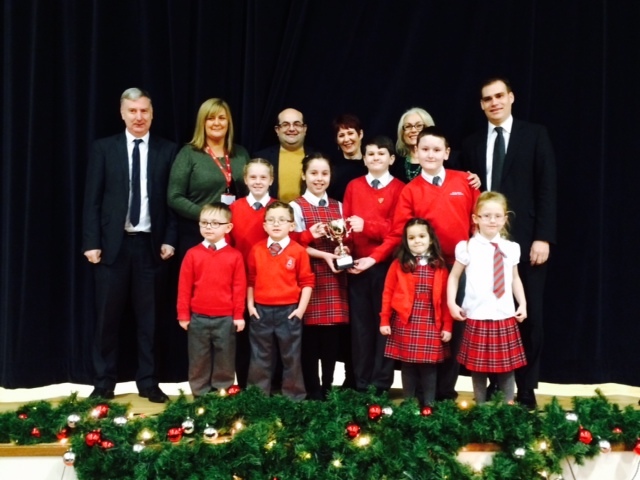 A South Lanarkshire School is celebrating after clinching a prestigious award for its work tackling sectarianism. St Blanes pupils, staff, parents, local MSP James Kelly and MP Tom Greatrex and Nil By Mouth’s Jennifer Henderson with the special award. Pupils at St Blanes PS, Blantyre have been announced as ‘Gold Award’ winners of – Nil by Mouth’s ‘Champions for Change ‘ schools accreditation programme. The campaign recognises best practice addressing and challenging bigotry across the curriculum, and schools have to achieve several benchmarks in order to achieve ‘Champion for Change’ status. The scheme was set up in 2011 and is supported by the Scottish Government. raising over £1,400 to support a range of anti-sectarian initiatives. ‘We have been blown away by the quality of the work which has been taking place in St Blanes over recent years and the school sets a brilliant example in their community. This award recognises the efforts of pupils, staff and parents who have stood up to be counted. They have shown real enthusiasm for engaging with others and exploring faith and identify in a hugely positive way. The school has created an environment where pupils are encouraged to learn not just about their own faith, but about other people’s as well. We hope these efforts will inspire other primary schools across the country to become ‘Champions for Change’. The award was also welcomed at Holyrood by local MSP James Kelly. “I was delighted to learn St Blanes had won the 2014 Nil by Mouth ‘Champions for Change’ Gold Award. The school has a real history of tackling sectarianism.